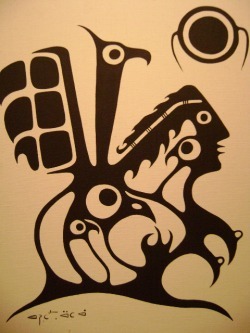 Ojibwa artist Isadore Wadow was born in 1950 in Beardmore, a small town in northern Ontario. Tragically, he was murdered in 1984 in Thunder Bay, just as his artistic career was poised to take off. Wadow was a self-taught artist of the Woodland Art tradition whose works have often been compared to those of his cousin, Norval Morrisseau. See the links to the left to learn more about the life and work of this talented painter.